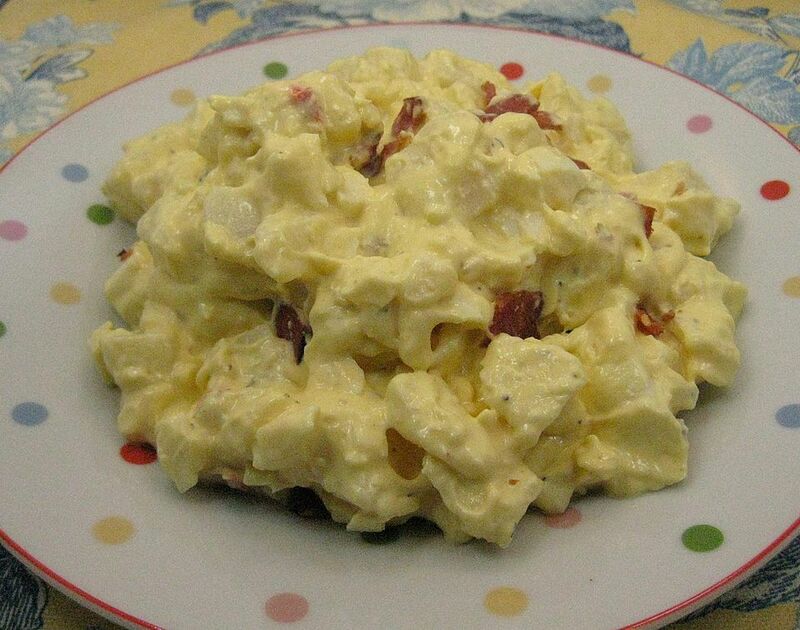 Bacon deviled egg potato salad is an incredibly good recipe that tastes just like a combination of deviled eggs and rich potato salad. This dressing, as a matter of fact, is just like the famous dressing for My Mother's Potato Salad, but with eggs added. And it really does taste like deviled eggs! Serve this recipe alongside barbecued ribs or grilled burgers or steak for a summer cookout. Add the potatoes and boil until tender, about 20 to 30 minutes. Check the potatoes constantly at 20 minutes. When you can stick a fork into the potato easily and it almost slides off the fork, the potato is done. Place the cooked potatoes on a wire rack until cool enough to handle. Don't let the potatoes cool completely because if they are still warm when they are put into the dressing, they will absorb more flavor. While the potatoes are cooking, remove the egg yolks from the hard-cooked eggs and place them in a large bowl. Mash the yolks using the back of a fork or a potato masher until they are smooth. Then gradually add about 1/3 cup of the mayonnaise, mixing with the back of a spoon until the dressing is very smooth. Then beat in all of the remaining mayonnaise, the Miracle Whip, mustard, and milk. When the potatoes are cool enough to handle, but still warm, peel them and cut them into cubes. Mix the cubed potatoes into the dressing as you work. Chop the egg whites and add to the salad, along with the celery, green onions, and bacon. Mix gently but thoroughly. Cover and chill for at least 4 to 5 hours before serving. While boiling the potatoes, keep in mind that the potatoes won't be all the same size, check them occasionally. You'll remove the smaller potatoes first. Be sure to use Miracle Whip, as this ingredient is slightly sweeter than mayonnaise and really adds a nice tang to the recipe.